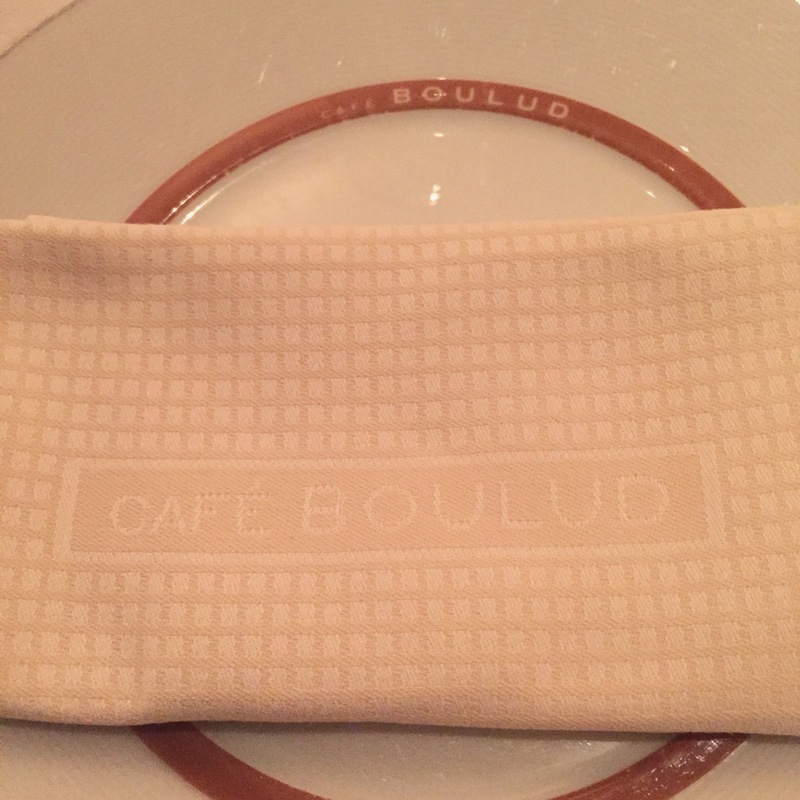 NYC: Cafe Boulud – Eat. Rest. Repeat. I just got back from the most amazing weekend in NYC. My friend, my husband, and I went to New York this past weekend to see an incredible artist who is only performing in two cities in the USA, with NY being one of them. The artist, Parov Stelar, performs electro swing dance music with a 5 piece band and a singer. The skill, musicality, and talent was spectacular. Anyhow, I really want to give credit to my husband for doing such a ridiculously great job of finding and reserving the restaurants this weekend. 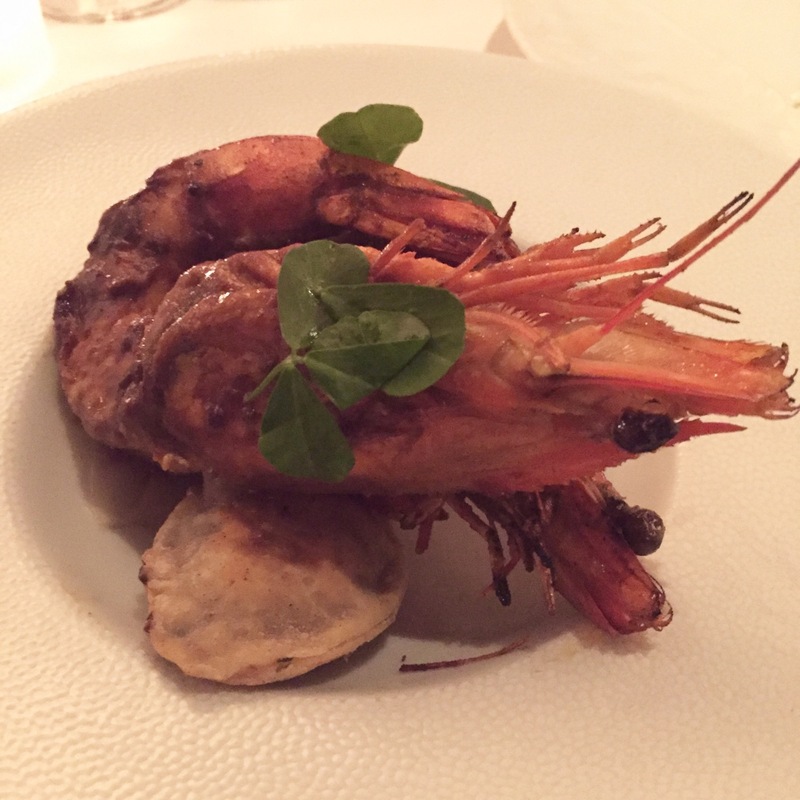 The food I ate on this trip inspired me to put my blog back on the forefront. 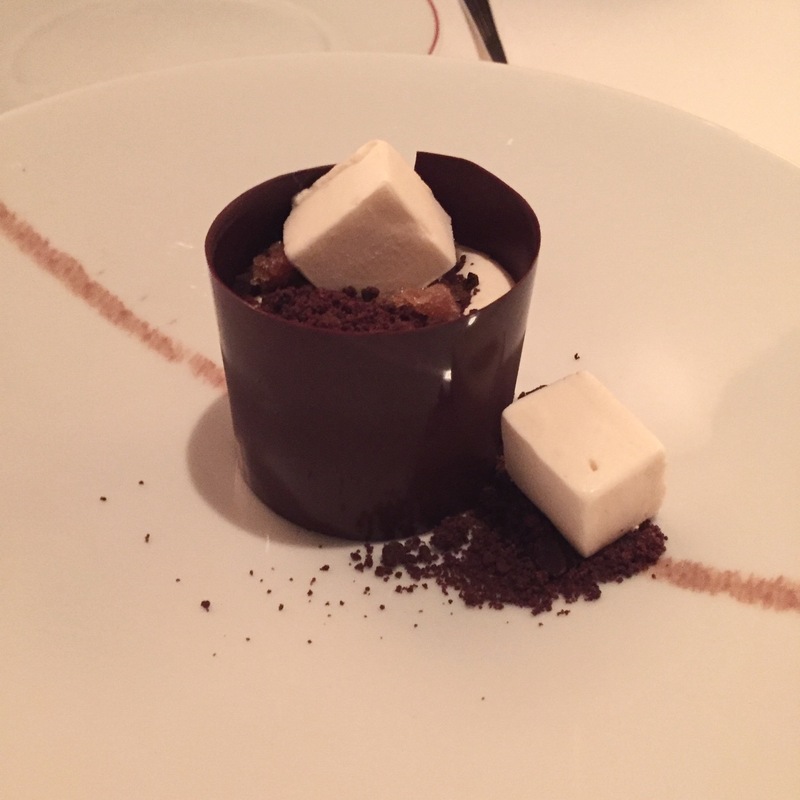 If you look back at my previous NYC entry, you will have seen my post on Boulud Sud….a restaurant I highly HIGHLY recommend. 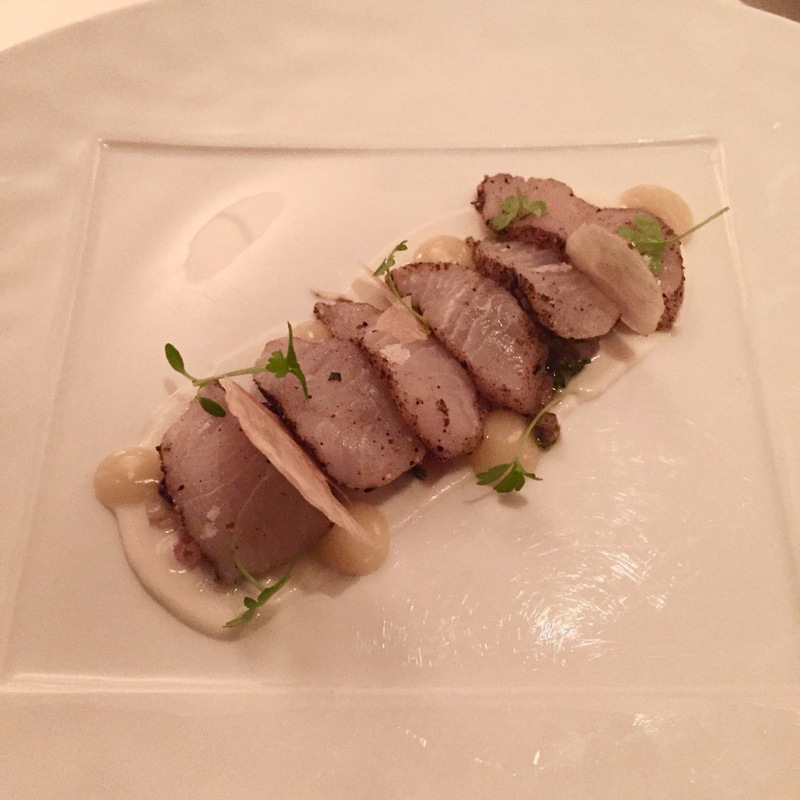 The owner, Daniel Boulud, has a couple other restaurants that are a little higher end. Friday night, after I landed, my hubby and I had the pleasure of experiencing one of his higher end restaurants, Cafe Boulud. The ambiance was a little snooty, and I was WAAAAY under dressed to say the least. I mean, there were folks in there with their fur coats on, tuxedos, the whole nine yards. I was dressed in a simple chambray denim button down with leggings and boots. Awkward. With that being said, I didn’t want to draw more unwanted negative attention to myself by using flash, so excuse my dimly lit photos. I tried editing them to the best of my ability without completely screwing up the colors. I also decided to do something different this time around; I took photos of the menu items I ordered….I’m realizing now that it may look a little hokey. Oh well! Above is the complementary amuse bouche. 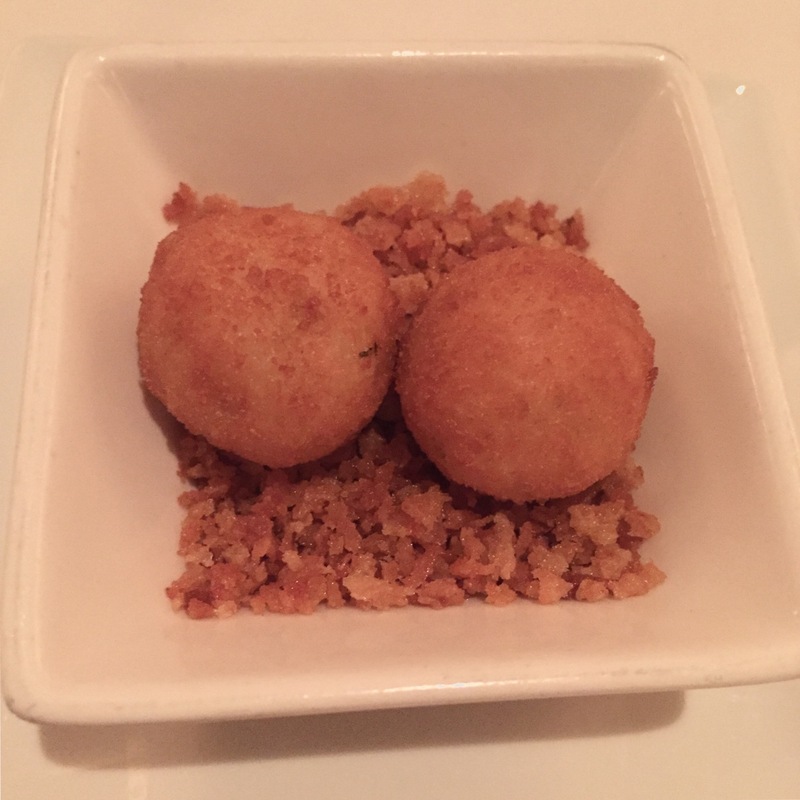 I think they were risotto balls….not quite sure, as they didn’t have much taste, even with that weird crunchy stuff it was sitting on. Hiramasa Crudo. The waiter indicated that Hiramasa is similar to a white tuna or yellowtail. To me, the texture and taste was more similar to the yellowtail (hamachi). Very mild, yet flavorful. The ingredients on the plate, when put all together, harmonized so well, I thought I had died and gone to heaven. It was that good. A symphony of delicate meat, sweet, sour, savory, and yet so beautiful. One of the best tasting presentations of raw fish I have ever had. 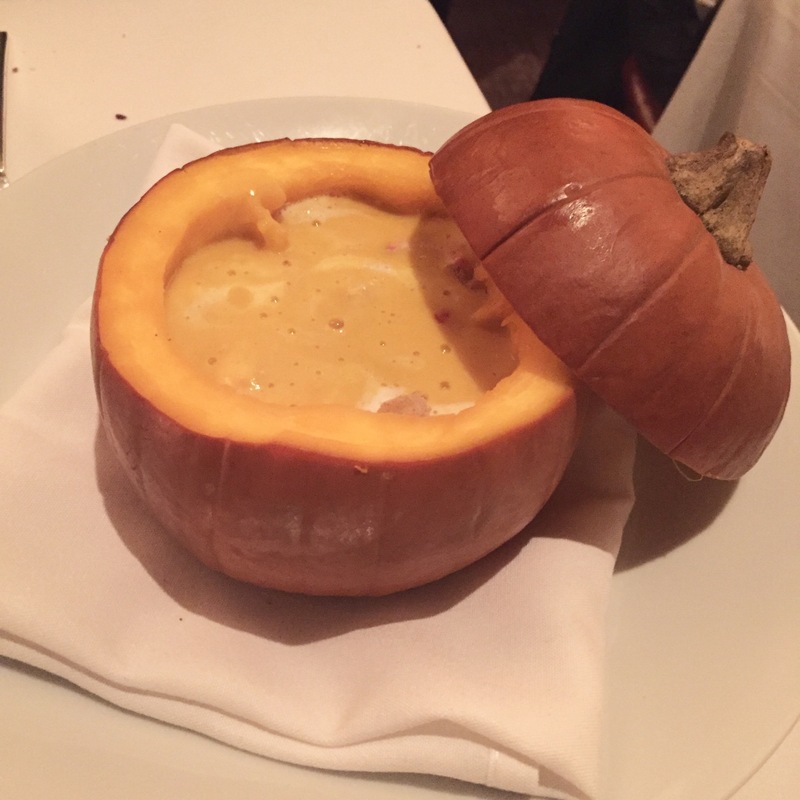 My husband ordered this pumpkin soup. He loved it. I wasn’t the biggest fan. It didn’t taste like anything special to me. Albeit, it was smooth, rich, and well presented, but to me it was too one noted. It needed salt…or pepper…or spice…or SOMETHING…something more than what it was. Growing up half Thai, and going to Thailand almost every summer in my youth, I would have prawn withdrawals. It isn’t very often you see such large succulent prawns in restaurants here, so when I saw this on the menu, I jumped at it! 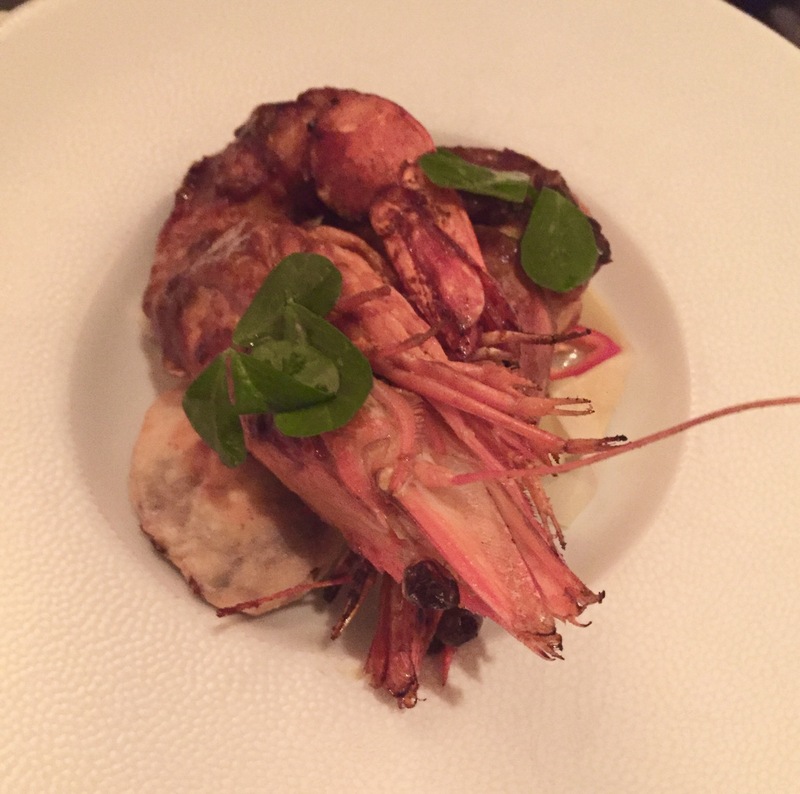 I wanted to fall in love with this dish, as it incorporates all my loves into one dish….prawns, tamarind, mango, a little Indian puff pastry…but it fell short. The mangoes were cubed with the skin on, and I think that was the factor that let me down. It gave this weird taste, I can’t put my finger on it, but it was not cohesive when eaten with the mango. Had the mango been a little more ripe with the skin off, or even pureed into the spices, it would have been PERFECT. This duck. This duck is the epitome of what love is and should feel like… perfection. This is everything I have ever wanted in a duck dish…all my life I have been searching, and finally, fell in love with the duck of my life. Maybe I exaggerated a tad bit, but holy hell this duck is the creme de la creme. Perfectly salted crispy outside, rich and medium rare on the inside, on a bed of black rice and sauces. Man, was I surprised…I thought they were beans (I quite dislike beans), but when I started chewing the tender yet crunchy spongy black stuff, my face lit up with happiness. I LOVE black rice! The texture was perfect, and was a great carb pairing for my excellently seared duck. There were some miscellaneous colored beets that were also cooked fantastically…not too soft or mushy, and not too hard or crunchy, alongside slices of tart orange, with a citrus puree beautifully placed around the plate. Absolutely the best duck I’ve had…at least, that I can recall at this point in time. My husband ordered the venison for his entree. Talk about seasonal food…this is an all encompassing autumnal dish. 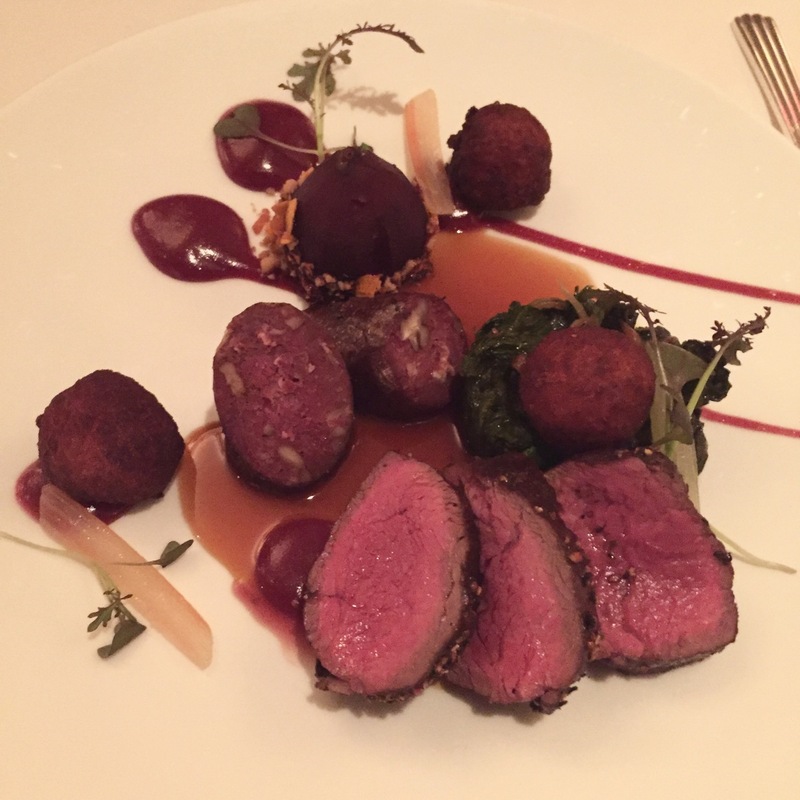 Imagine returning from a hunting trip and presenting your fresh deer to a 5 star chef…this is what the end result would be. Venison cooked two ways, in medallions, and as a sausage. The sweet potato balls were hearty and had the right amount of warmth and sweetness, the sausage was a tad grainy, but neither venison items were gamey. Both were quite mild in flavor, and super tender. The pear crumble…I could have eaten that on its own. Pies and crumbles are a staple in fall food, and the pear crumble was everything you could want to accompany such a rich and hearty meal. 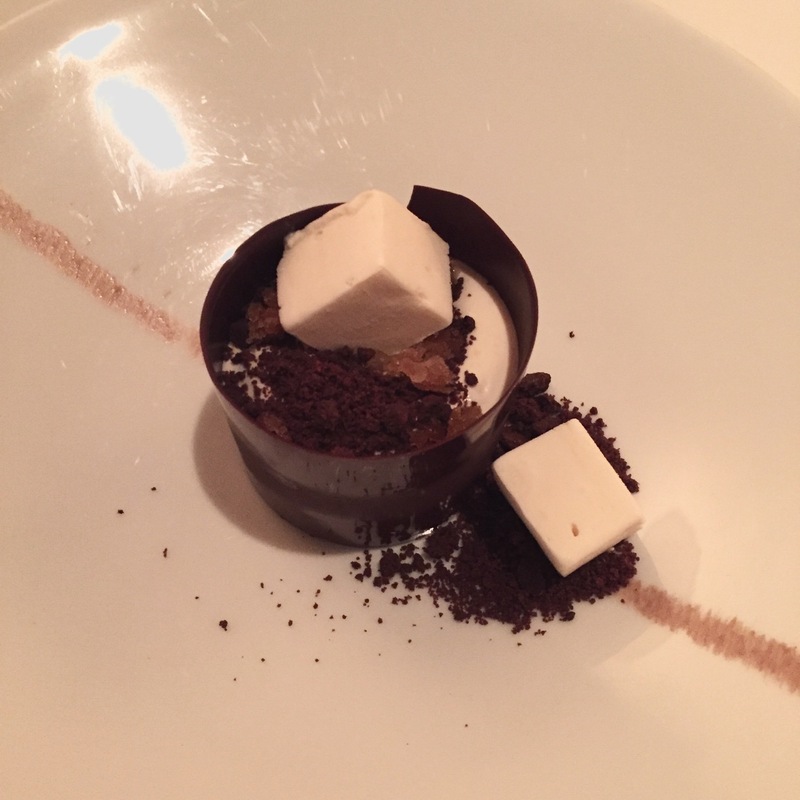 This dessert was…meh. Nothing spectacular, certainly not something I would order again. 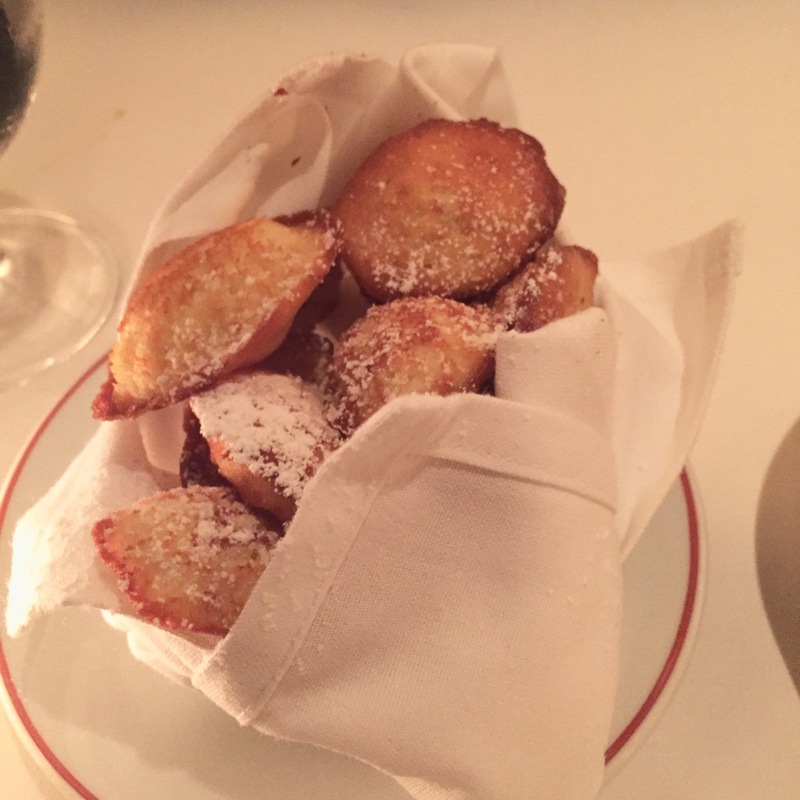 After your meal, they present you with a warm, fresh batch of madeleines, which are french butter cakes. So addicting…great to pair with coffee or tea, to finish your night. They were lightly dusted with powdered sugar, with a lingering lemony taste. Wish I had known they were coming, because I could have gone without that dessert. 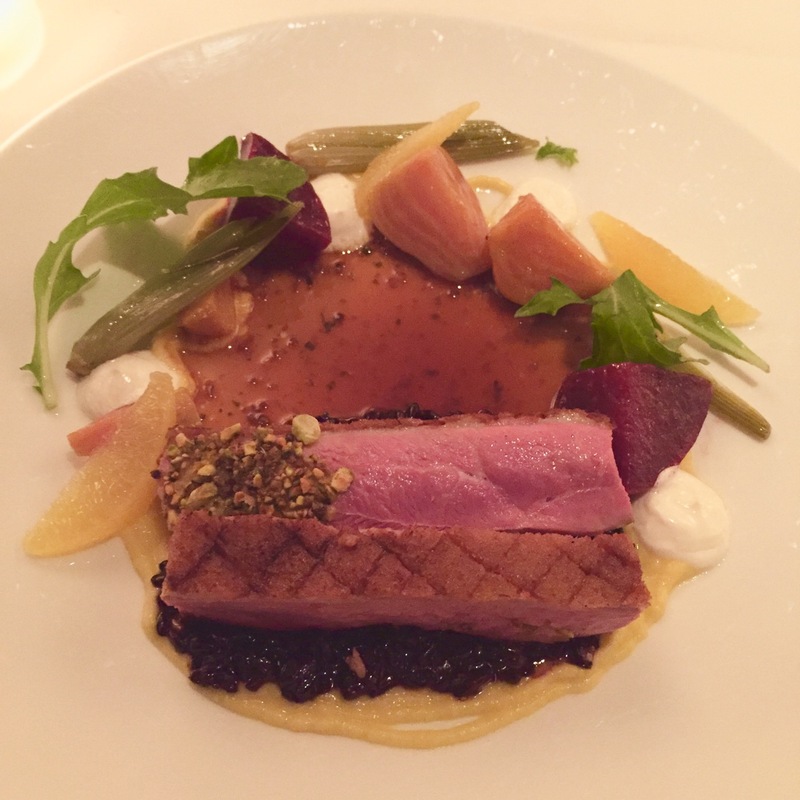 Cafe Boulud changes their menu seasonally, and they have a daily market fresh menu as well. Something unique in what they have also, is that their menu consists of 4 different sections. French country classic, seasonal food, farmer’s market inspired food, and Indian inspired food. Basically, something for everyone’s taste buds. The food is phenomenal, the service is top notch…just make sure you are well dressed upon entering.